Former President of the United Nations General Assembly John Ashe. United Nations Secretary-General Ban Ki-moon has requested that the Organization’s Office of Internal Oversight Services (OIOS) launch an audit of the interaction between the UN and the Global Sustainability Foundation and the Sun Kian Ip Group, and the use of any funds received from these entities, according to a UN spokesperson. The request follows news earlier this week of serious allegations by United States’ federal prosecutors against John Ashe, a former President of the UN General Assembly. “The Secretary-General is concerned about the serious nature of the allegations, which go to the heart of the work of the United Nations and its Member States,” said a statement issued by Mr. Ban’s spokesperson. 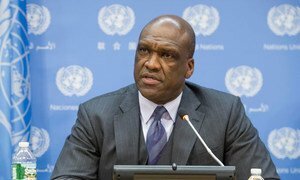 Top United Nations officials expressed today that they are “shocked” and “deeply troubled” to learn about the “very serious allegations” announced this morning by United States' federal prosecutors against John Ashe, a former President of the UN General Assembly.